A mix and match T, plus this and that | Fabric, Thread, Clothes? I went down to the sewing room this morning without a real goal in mind. I saw the machines were still threaded with black, realized the next T in the line up was also black….so the decision of what to work on was made! This T ended up being the compilation of Vogue 8536 with the sleeves from Jalie 2566. I think this one is almost perfect! I do see that I need a little swayback adjustment. Before we get into that, let’s review since I had a chance to take some pictures today. Here is the purple Jalie 2805. 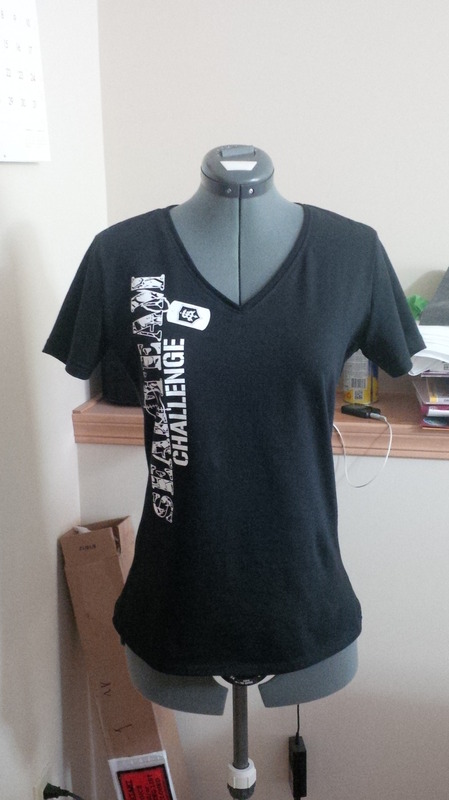 Still the best T ever for fabric with 4 way stretch. Then we have the Vogue 8536. This is the one I made last night with the vogue pattern sleeve that was designed to be set in, rather than sewn in flat. Vogue, please, please update your knit patterns!! On this one, I trimmed the cap down (the good ole “eyeball” method – I took off about a half an inch on the top and graduated it down to the sides) and it was still difficult to get in. My eyeball method usually works. It looks ok though. Looking at it on me, you can see the need for the swayback, and you can also see that it looks like the shoulders aren’t quite wide enough. Of course, I didn’t take these pictures until after I had made the one today, so I didn’t pick up on the swayback, but I did notice that the shoulders weren’t quite wide enough. 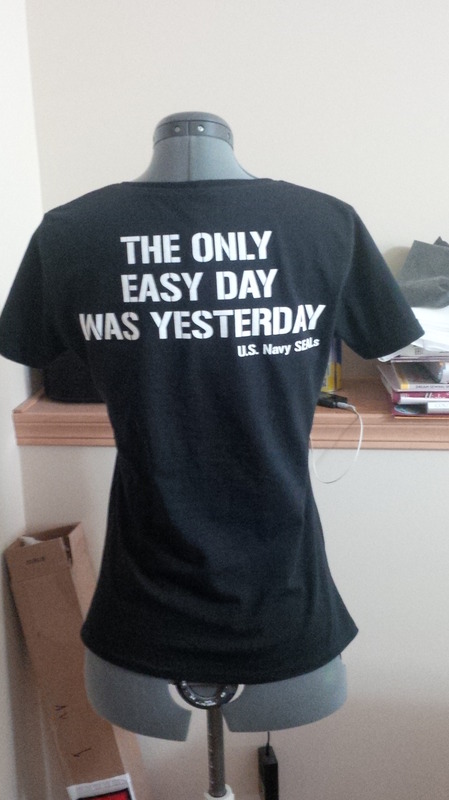 This was a T shirt that I got from participating in a Challenge issued by a Navy SEAL on his website. The challenge is a series of videos designed to better yourself by focusing on different aspects such as goal setting, dealing with adversity, leadership, even nutrition. Overall good stuff. Here’s a link if you want to learn more and support one of our defenders: http://www.sealteamconsulting.com/. The T came incidental to the course, so no, I have NOT broken the RTW fast! (Although I have been tempted lately…but I am resisting! :)) Anyway, it was your basic, crew neck-ed, boxy T. I really didn’t see myself wearing it too much, so a makeover was in order. 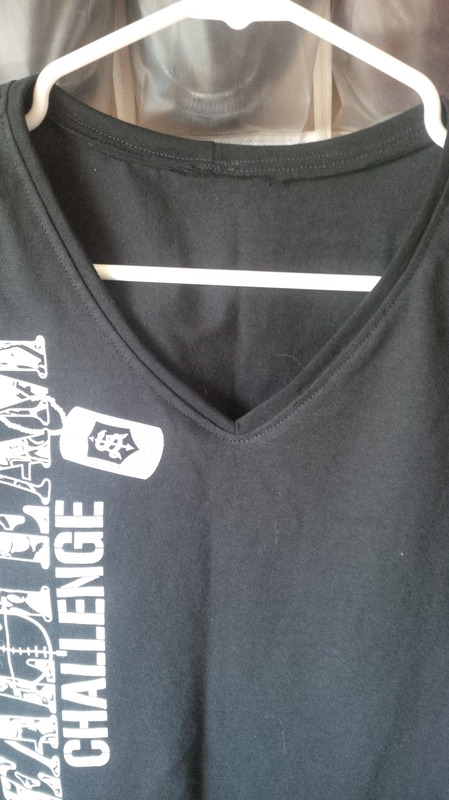 Here’s a closeup of my finished neck, I used the Vogue finishing option plus topstitching. 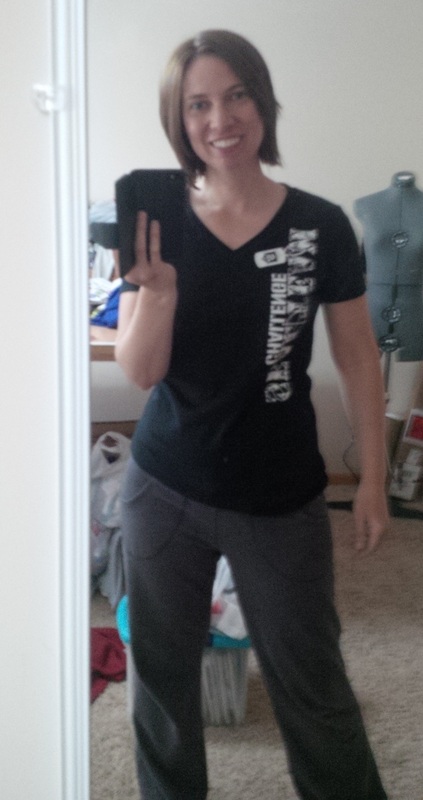 Here’s the goofy sewing room selfie…not that all of the other ones aren’t goofy, but you know what I mean. Also, for those curious, I did a comparison of the Vogue with Mccalls 6964, a relatively recent Palmer Pletch release. Here are the front pieces laid on top of each other. My mini comparison showed that the Vogue has a wider shoulder (especially when you consider that you lose 5/8″ of the Mccalls on each side due to the seam allowance. For the Vogue, you lose 5/8″ on the shoulder and 3/8″ on the neckline), while the Mccalls is wider at the hips and slightly longer. They both have nice waist shaping. 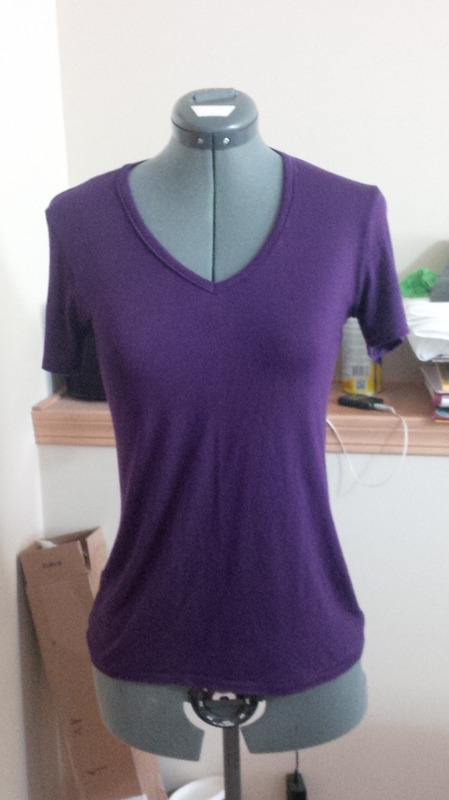 My hips are usually a 14, the Vogue envelope I bought only went up to a 12, so I sewed the entire side seam at 1/4″. I could have shaped in a little more at the waist, but I was just trying to keep it simple and I didn’t want to make it too tight. So I’m still thinking the New Look may be up next. 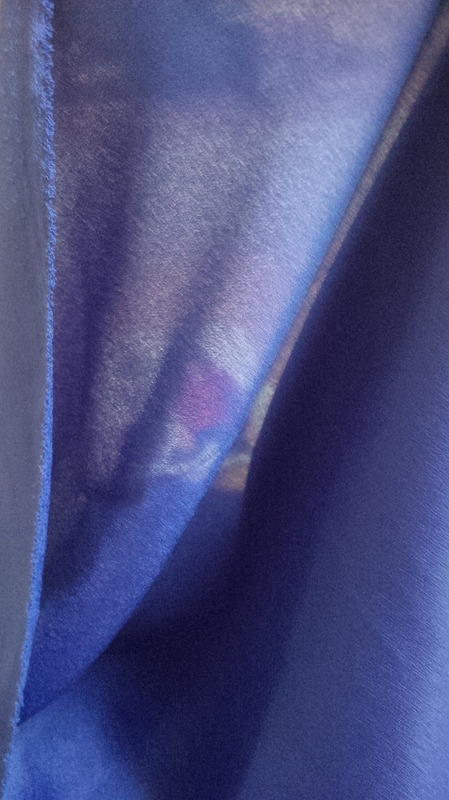 That’s the blue fabric I mentioned…you can see how sheer it is, so a double layer would be required on front and back. I think I like View B of this pattern, but I don’t really like how the neck binding goes in front. I realize that if that weren’t there though, the top would likely not stay where it’s supposed to. I think that’s what’s stopping me from jumping into this one. There’s a similar pattern out by McCalls right now without the neck dealio, but I don’t like how it’s constructed as much . I’m loving this three day weekend! 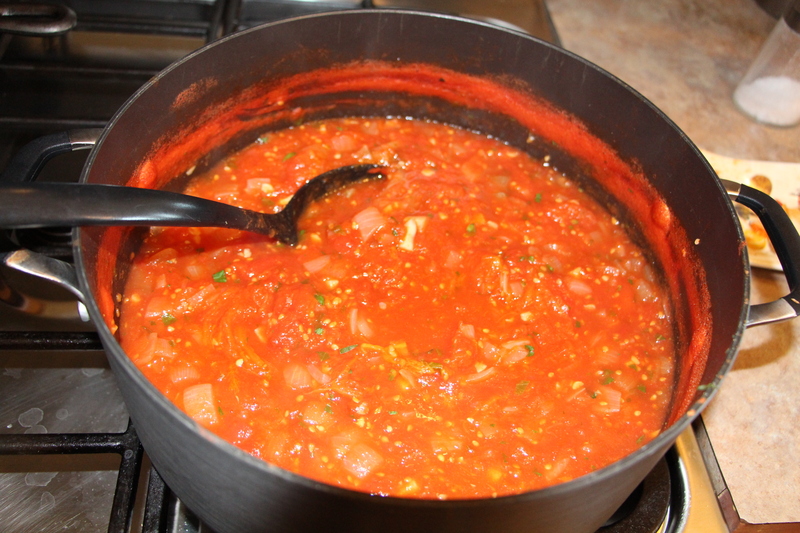 Besides playing in the sewing room, I’ve been making marinara sauce today! It’s one of my favorite late summer activities! 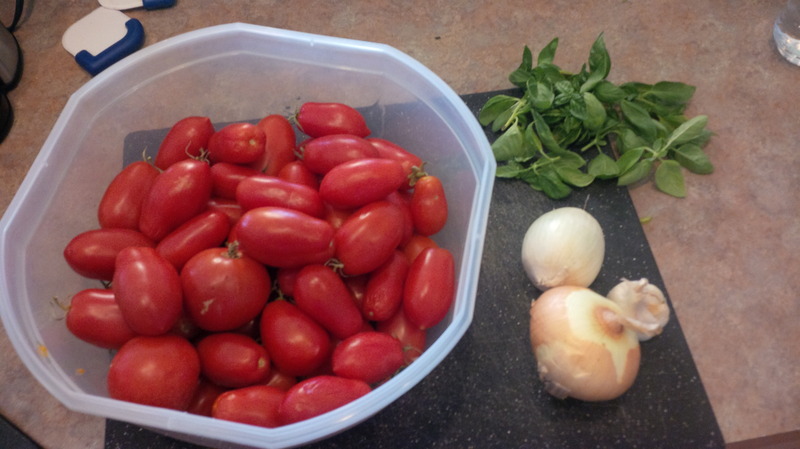 I’ll freeze it in 2 cup or so portions and we’ll eat it here and there through the year until it’s gone. It looks an odd orange in the pic, but trust me, it’s red and delicious! 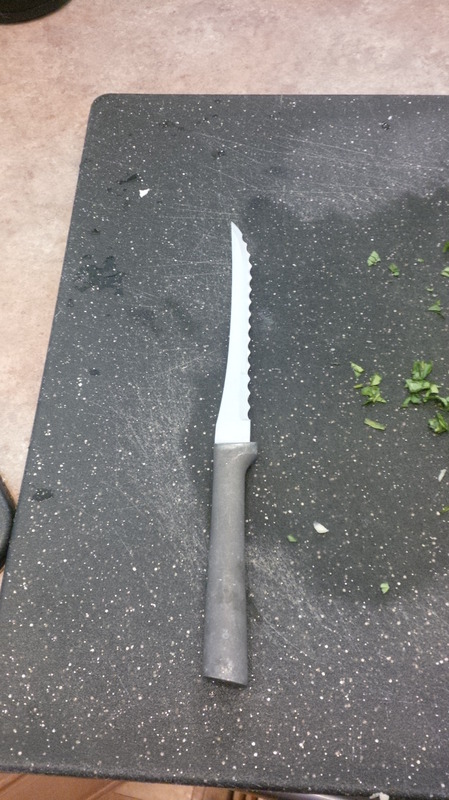 For those who work a lot with tomatoes, this is the best ever knife for cutting them up. 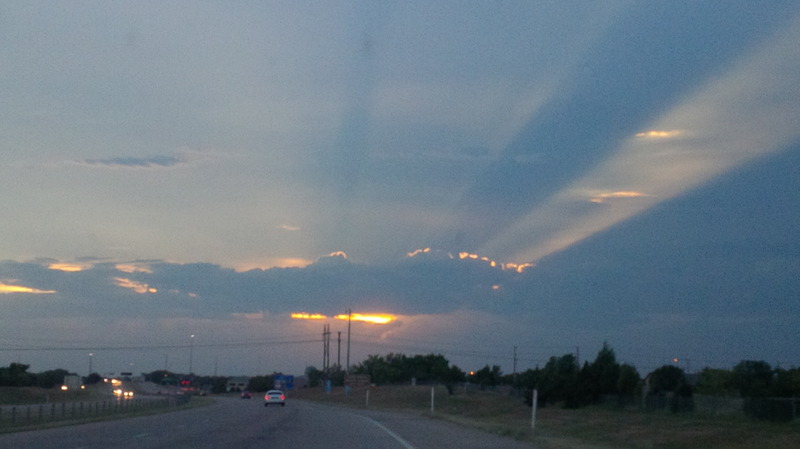 Check out this sunset we had tonight! It was amazing! Happy Sewing (and cooking…or whatever you choose to do)! Note: I’m not affiliated with any product mentioned….I’m just a happy consumer! This entry was posted in Jalie, Life, McCalls, New Look, Reviews, RTW Fast, Vogue. Bookmark the permalink. 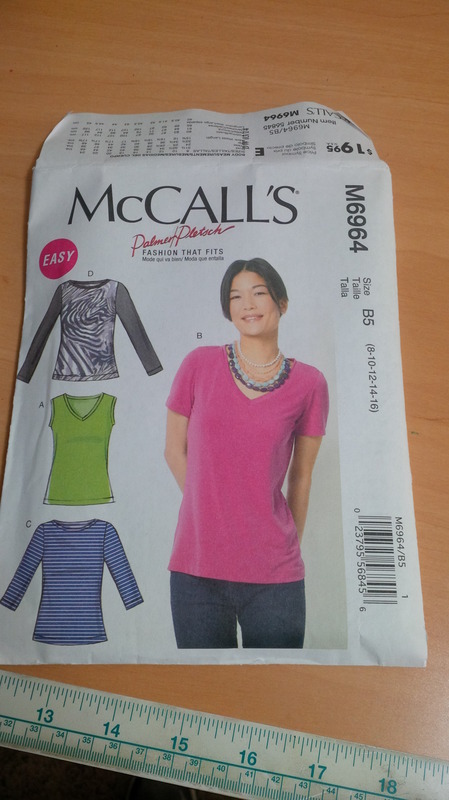 Thank you for the Vogue 8536 v. McCalls 6964 comparison, as I just made 6964 and your tee looks nicer than the one I made. Also, what is with these ridiculously high sleeve caps? 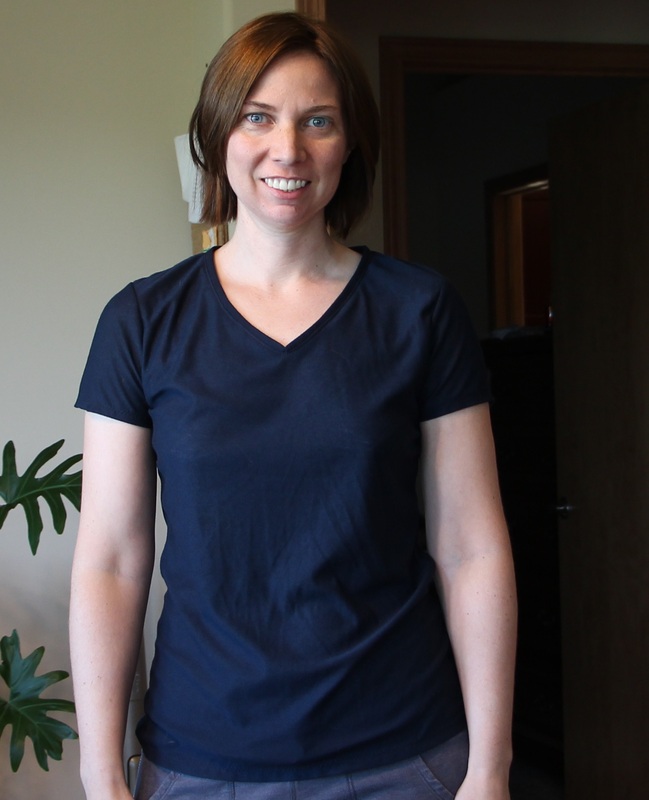 T-shirts were originally supposed to be t-shaped, which is no sleeve cap height. I don’t mind some to add shape so it doesn’t look like I stole my husband’s shirt, but the amount used and the notion of a set in sleeve is insane. Then again, it’s no better in the woven patterns, where I too like to use the eyeball method to remove excess. I know!!! I just wish the big 4 would get a little more progressive in their knit drafting and instructions! It’s taken me years to figure out my little tips and tricks and it shouldn’t be that hard! !